1. Were you at all surprised by how easily things went back to normal? Did you expect something different? Nope. I knew it would the second Bella and Edward were together. 2. Do you think Bella is playing a dangerous game trying to be friends with a werewolf and date a vampire? Ignoring what you know about Eclipse and Breaking Dawn - how did you think this could ever be resolved? What were your hopes for these relationships at the end of the book? Yeah, she is! Emotionally as well as physically, for herself AND them. I had no clue whatsoever how it could be resolved. I didn't have much hope for them - I thought she'd have to make a choice and suffer whatever came of that. Obviously she'd choose Edward, and full scale war would come from that one between the Quiluetes and the Cullens. 3. What did you think about Jacob giving Charlie Bella's motorcycle? That was underhanded. I was mad, so mad at him over that. It wasn't until I reread the chapter that I understand why he did it. And not saying he should have, but maybe he was a little entitled to do it - to try to keep her from the guy that in his opinion hurt her and is a mortal danger to her. Can't blame a guy for trying, especially if he's as heart broken and clearly not thinking cleverly, like Jake is at this point. 4. What did you think about the difference between "bite" and "kill" and the point Jacob was making? That was pretty clear - the treaty specifically stopped them from biting another human, which would not only cut out the most likely way of killing a human, but put an end to turning them into a vampire. Jake doesn't want Bella to become a vampire, and he's reminding Edward that whoever bites Bella and turns her, even though she wants it, will have a whole pack of wolves down on them for breaking the treaty. No true love should work that way. Nope, things could be solved by sitting them down forcing them to talk, Edward never to leave again and Bella and Jake to stay friends. That the treaty would be broken if Edward bite or changed Bella but not if he killed her, and that Bella can never be changed by one of the Cullens withouth causeing a fight. I wasn't really surprised. I didn't really know what I expected actually lol. I hoped that her and Jacob could work things out, but that he had to realise that Edward was back, and Bella was always going to be Edwards and never Jacob's. Oh man, I was so so mad at him for that!! I thought it was so low of him to do that! I totally understand why Bella felt so betrayed by him...It was really nasty. That totally threw me! I had forgot it was "bite" not "kill", and I was looking forward to Bella becoming a vampire. And then I was like, "oh no, how is this gonna work now?" lol. That was one of the things that stuck in my mind long after finishing the book. It made me sad to realise that if they did go through with making Bella a vampire, it looked like there was gonna be a war between the wolves and the Cullens. Ehhh,.. kind of. Edward was the missing piece. When he came back to Bella her hole was filled,.. everything was right. I wanted Edward and Bella to be together.. but poor Jacob Black! I had NO idea how any of this could work out to be a happy ending.. I wanted Jake to be happy,.. I just didn't see how it could happen though. They have to bite Bella to turn her into a vampire.. I never caught that before now. I'm quite surprised the treaty covered that detail or would even think that there was a possibility they would create more vampires. SM is so amazing! 2. I thought that Jacob would act like he acted... without the motorcycle thing... He was so hurt and betrayed. Bella ran away and left him there, to fly across the world to save, and probably die in the middle, the vampire that left her here, broken in pices, that he "fixed"... can you blame him for what he did? 3. No matter how much I love Jacob, and I love him so much, this was immature and childish.. He shouldn't have done that... I understand why he did it of course, but this was a stupid act.. I wasn't really surprised. I was glad things were back to normal. I was sure Bella would always be with Edward. And I figured Jacob was going to be a problem. I found it annoying. I was like: Jacob, she dumped you! It's not of your business anymore! Uh, I was mad. He crossed the line. I was just mad at him. I figured he wouldn't live them alone for a while. I didn't expect it to go back to normal that quickly. I hoped that she could still be friends with Jake in some way. But I could understand that Jake wouldn't want that. Not only because Edward is a vampire, but because, in a way, he was betrayed by Bella. I was so mad at him! I understood it, but I thought it was stupid, because of Bella choosing to be bitten instead of one of the Cullens biting someone against their will. I was surpriced that it went back to normal so quickly but I guessed it would happen sooner or later. I was surpriced that Bella could be so sure of Edwards feelings about her after just a few days. If it was me I would have doubted him for a long time! After all she did think she wasn't "good enough" for him or that he thought so. That is a pretty cruel insult and something I don't think anyone could forget easily... Said that I still think they belong togeter and wouldn't want it any other way. I was sort of hoping Jacob would head off to college or something so we didn't have to hear of him ever again But i knew that was never happening...Of course I hoped they would all get along one day because I thought Bella had good intentions. 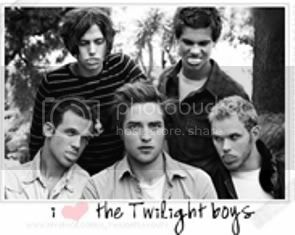 I believed Edward and Jacob had a lot to learn from each others lives and Jacob definately needed to learn about "good" vampires! Pig-head!!!! Oh my god! That guy can be more stubborn than Bella! I found him very selfish and narrowminded. He had desided on one set of thoughts and explonations and was not really interested in hearing the truth! I just absolutely hated him! I don't think I really thought about it that much. But I might have been thinking something like: "Wow he is really slow! Hasn't he realized it yet?!" I answerd these questions trying to remember how I thought when I read it the first time back in february this year. After re-reading it I have changed my point of view a little bit. Knowing now how it all ends I have more understanding for Jacobs feelings and don't find him as irritating any more. Although he should really think before he talks most of the times! Yeah, I was kind of surprised, actually. I was expecting a bit more conflict than that, haha. I already knew about Eclipse and Breaking Dawn, so I had no other predictions. I didn't understand it... He was getting himself in trouble just as much as Bella. I understand Jacob's point, but I do think there's a difference between biting and killing. There shouldn't be anything wrong with biting someone as long as it's consensual, haha. Nope. Carlisle's a good enough doctor that they'd want him back, and I don't think Forks High School would have received so many applications that they wouldn't have space for Edward and Alice. And the way Bella and Edward felt about each other didn't change, although any doubts they had about it have now been resolved (at least from the questions raised in this book). I was hoping she'd stay with Edward, but I wanted Jake to be happy too. So I hoped that he would find someone else who would make him happy. I thought that it was a betrayal that displayed yet again his tendency to act without thinking. I could see why the Quileutes would have such a restriction. It made sense, although it didn't really apply to Bella, as she was choosing it, whereas the restriction originally applied to someone having their life taken away against their will, as it would be if they were killed by a vampire for food.